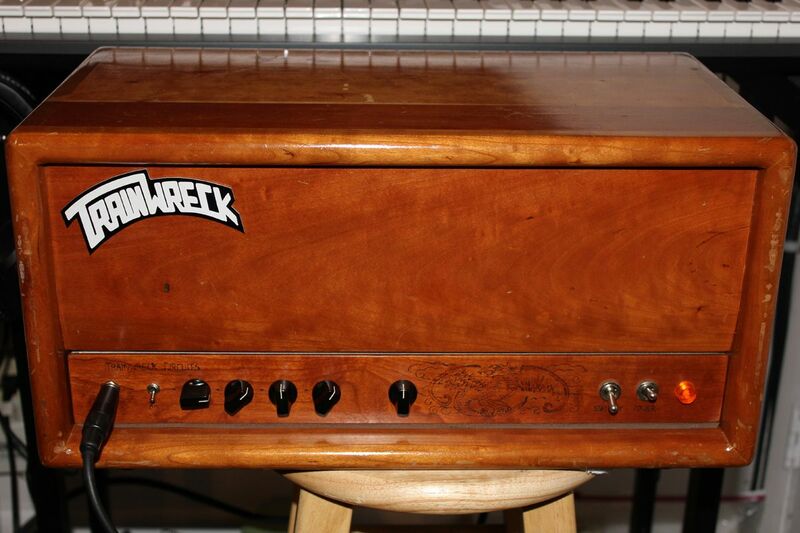 THE "TRAINWRECK" SOUND - A huge part of the Trainwreck sound is the response and feel from clean to mean all with the guitar knobs. Though they have quite a bit more gain on tap than most any typical single channel amp, they clean up very well by backing the guitar down. Also the amp has quite a bit of compression but it’s not the loose kind of compression of a Tweed Fender or Marshall JTM45. It is more like a nice studio compressor placed after the microphone. The benefit of this is mainly in the volume leveling effects, and the amp doesn’t actually sound squished. With the amp set at fairly decent gain levels if you back your guitar down to say "3" you will get excellent cleans but the volume will be almost the same as fully cranking your guitar into full overdrive. To me this makes working the guitar knobs quite usable on stage in a band situation, and quite expressive pardon the pun. It’s almost like taking an overdrive pedal and putting a compressor after the overdrive. Another good comparison is an Express can actually respond a bit like a Germanium Fuzz Face, however the actual tone is much more traditional and usable for a wide range of playing styles. Many amps (especially classic Marshalls and Fenders) clean up well from the guitar, but can't be set for as high a gain as an Express and still clean up on the lower side of the guitar knobs. The gain levels of Express is actually quite high for a single channel amp, and when on 1/2 they tend to be as gainy as a fully dimed (all knobs) 4 input Marshall. At fully dimed the Express is at “metal” levels of gain. Typically, the most often missed aspect from clones are not getting the amp to clean up as well (and with the volume leveling compression) of an original Ken (Fischer) built amp. Also on the originals there is a sweetness in the extreme top end which helps the amp not sound shrill or too bright. Almost like there is a little bit of extra high end compression and smoothness, that only kicks in on the high note range.